My name is Jakub. I was born somewhere in 1991 in a cold Poland. I've been a PC Gamer since 1996. I grew up playing classics like Descent, Quake 2, The Settlers II: Veni, Vidi, Vici and many others, majority of which were shooters. I'm using gaming mice and I'm not afraid to use a gamepad, when it's required. I do additional testing for old games and look for workaround using Oracle VM VirutalBox and Windows 98 SE. Leaked Video Games - games that had their pre-release builds leaked. Research bunker - beware what my brain came up with. Sui's Hall of Fame - because sometimes people on the internet are really awesome. Useful stuff - mostly advertising. Update notes - Some random stuff which I found funny. GitHub - my GitHub page. Twitch - my Twitch channel. 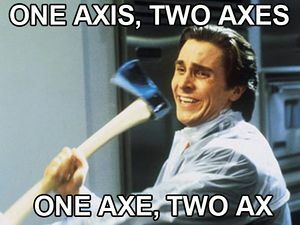 Yes, it's really two joystick axes. This page was last edited on 19 March 2019, at 22:58.